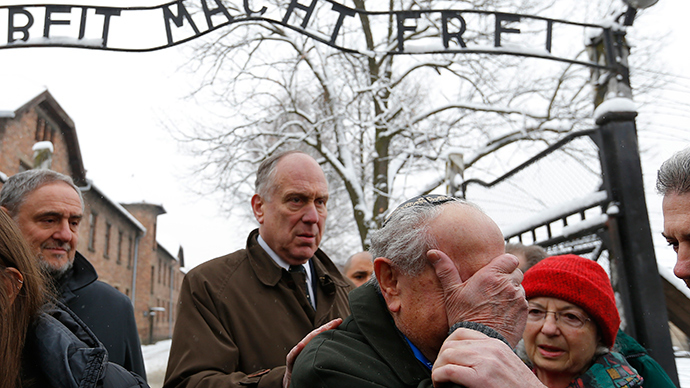 Many nations on Tuesday are commemorating the crimes of the Holocaust by Nazi Germany. An international gathering at the Auschwitz death camp in Poland is missing the leader of the nation, whose predecessor liberated its prisoners 70 years ago. The event is being attended by 12 presidents, five prime ministers some 300 survivors of the camp, where more than 1.4 million people, most of them European Jews, were killed over five years of Nazi rule. This year’s commemoration of the Holocaust tragedy is of special significance, since it’s likely to be the last major anniversary which most survivors will be able to attend. The youngest ex-prisoners of the death camp are now in their 70s. Speaking on the eve of the anniversary, German Chancellor Angela Merkel stressed that Auschwitz is a reminder of where the path of hatred can lead to. "We Germans feel great shame for what happened. Germans are guilty of the suffering and the deaths of millions of people, and some Germans tolerated it. We don't want to hear slogans full of hatred against people who are believers or believe in different religions," the German leader added. Merkel’s speech blasted forces in Germany supporting the self-styled ‘anti-Islamization’ movement PEGIDA, thousands of members of which march in several German cities every week. The movement poses itself as countering hostile immigrants defying the German way of life. Many German politicians see them as xenophobic and leaning to an ideology not unlike that of the Nazis. The meeting of foreign dignitaries in Poland is marred by the political crisis which plunged relations between Russia and Western nations to their worst point since the Cold War. Poland chose not to invite Russian President Vladimir Putin to Auschwitz in an apparent political move to highlight his position. #German newspaper Junge Welt expressed outrage that #Putin was not invited. Warsaw didn’t outwardly ban Putin from coming. Instead it changed the protocol for this year’s ceremony and didn’t invite any foreign leader. At the same time Ukrainian President Petro Poroshenko would be a guest of honor at the Tuesday commemoration, as he was personally invited by Polish Prime Minister Ewa Kopacz. Efraim Zuroff, responsible for bringing many indicted #Nazi criminals to trial, criticized this year's event for shunning #Russia. Russia is represented by Sergey Ivanov, who head’s Putin’s office. The Russian president instead will be attending a Jewish museum and tolerance center in Moscow, the Kremlin announced. Many feel outraged at #Obama paying respects to a late #Saudi despot, while refusing to commemorate the victims of genocide. Another world leader not attending the commemoration is US President Barack Obama, who is instead visiting Saudi Arabia on Tuesday. The quiet diplomatic scandal is aggravated by controversial statements made last week by Polish Foreign Minister Grzegorz Schetyna, who gave credit for liberating the prisoners of the death camp to Ukrainians, because the force that did it was called the 1st Ukrainian front of the Red Army. The statement is historically inaccurate, since the front was named after the territory where its operations were conducted and composed of soldiers of numerous ethnicities, including Ukrainians, Russians, Tatars, Chechens, Poles and many others. Many people criticized Schetyna, who had to explain that he unintentionally generalized an episode of the liberation – the gates of one of the death camp’s facilities were torn down by a tank driven by a Ukrainian soldier. In a bid to put an end to the speculation over who exactly liberated Auschwitz, the Russian Defense Ministry on Tuesday published a number of archive documents relevant to the historic event. Among the documents is the troop roster of the 60th Army of the 1st Ukrainian Front, which has been credited with the camp’s liberation. The document lists the 39 most numerous ethnic groups for soldiers, NCOs and officers enlisted in the 60th Army. It says there were 22,294 Russian soldiers, 12,603 Russian NCOs and 7,501 Russian officers, totaling 42,398 troops. With regard to the Ukrainians, the numbers were 28,347, 7,568 and 2,126, respectively, totaling 38,041 troops. There were also 1,210 Belarusians, 1,088 Tatars, 1,073 Jews, 838 Uzbeks, 711 Kazakhs, 555 Armenians, 546 Georgians and smaller groups of people of other ethnic origins, including Greeks and Chinese. Schetyna’s words and the debacle with the Auschwitz ceremony invitations don’t quell suspicions in Russia that the Polish government is perverting the historical events to fuel an anti-Russian agenda. Warsaw has been one of the most vocal critics of Moscow over the Ukrainian crisis and a supporter of the political forces that took power in Kiev in an armed coup in February.